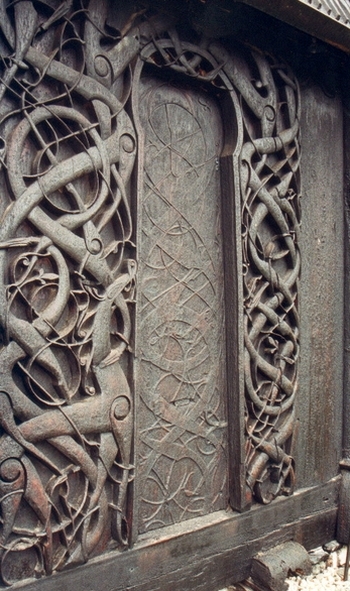 The wood carved portal of the Stave church is covered with elaborate patterns. The portal is an example of Viking art that was stylized over time. The doors were made somewhere between 1050 and 1070 in Urnes, Norway. The patterns that adorn the portal are mixed with animals. Which animals they are is hard to decipher because of the intricate patterns. The interweaving animals were a Viking custom. The door is covered with thick and thin strings winding around the portal. The wood is precisely carved and almost perfectly intact. The door has faded to a grayish color because of its old age. The image is hard just as the Vikings were yet, it is very beautiful.